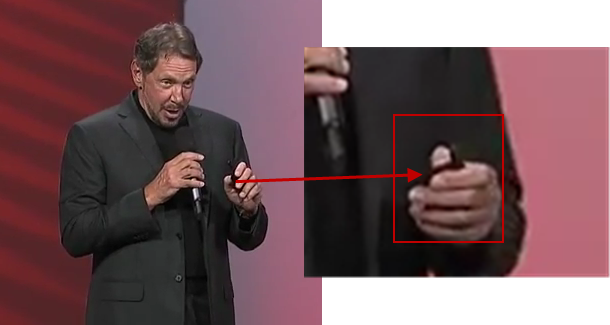 Oracle’s CEO had a number of interesting announcements. Oracle will provide cloud services (no surprise) on all three tiers: SaaS, PaaS and (the surprise) IaaS. Competing directly with Amazon EC2 – a company with many years of experience in the area. Perhaps making smart use of virtualization (OVM) and having its own hardware allows Oracle to have an edge on Amazon and others. 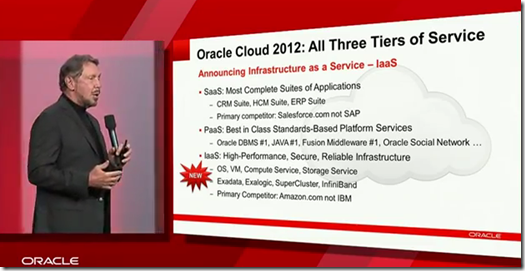 I am curious to learn in which circumstances the Oracle Cloud IaaS offering will especially compelling. Any part of the Oracle Cloud that involves Oracle’s own software that provides the attraction – the Oracle Cloud can be an obvious choice, if for no other reason than software can be offered at virtually any price level. Where the offering is more commodity – how does Oracle make the difference? Running on high end Exa-machines may sound exatic or exastatic but in the end what Ione gets is compute power. If that meets the requirement, I do not care at all which hardware produced it for me. An interesting proposition is the Oracle Private Cloud. Unlike before – when private cloud was Oracle’s marketing line to keep selling on premise software – that may allow an enterprise wide IT department to offer shared services with pay-per-use to a company’s internal customers while still having a maximum capacity license deal with Oracle – the Oracle Private Cloud is now something more interesting. It allows organizations that for regulatory reasons cannot have their data leave their own site to benefit from most of the advantages of the cloud. The Oracle Private Cloud is exactly the same as the public cloud offerings, only the location of the hardware is different. Both the service levels around the private cloud and the payment model are exactly the same as the public cloud – Oracle owns, manages and operates the hardware and sells its computing power as a pay-as-you-go service. This offering is unique as far as I know. The importance of this release for the cloud approach with a substantial level of multi-tenancy at database level is pretty big. Read an early review of what Larry said on http://www.zdnet.com/ellison-keynote-at-oow-its-about-speed-and-cost-7000005011/, which states that “the multi-tenant pluggable database architecture consists of the memory, processes, and storage of multiple databases all consolidated into one container database” and “Ellison stressed that this combines all the benefits of multi-tenancy as well as hardware and operational efficiencies without any change to the application at all.” So while various tenants of the Oracle Cloud have their own isolated database, this is part of the container database that are shared with other tenants. Run time processes and resources are shared over tenants – allowing Oracle to more efficiently offer the Database Cloud Service without sacrificing the isolation of each tenant. 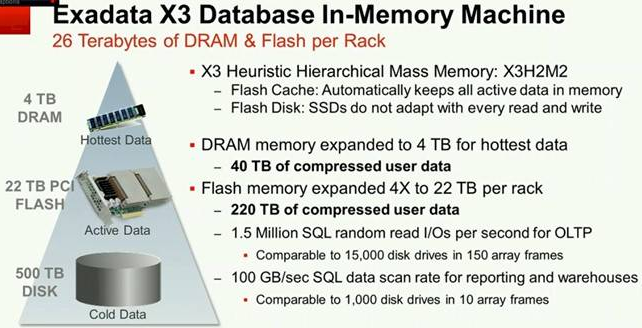 The Exadata X3 Database In Memory Machine uses 26 Terabytes of memory (that is 26 Tb !- split among 4TB of DRAM and 22TB of flash cache, in one rack – four times the FlashCache size of the previous version of Exadata) that allows you to store entire databases in memory. Everything in the SGA. The Exdata X3 starts at $200k, an 1/8 rack – however with that minimum configuration you obviously do not get all 25Tb. However, this 1/8 rack should be faster than much larger configurations of the previous generations of Exadata. “This is the hardware version of the Oracle cloud,” Ellison said. “Everything is in memory. All of your databases are in-memory. You virtually never use your disk drives. Disk drives are becoming passe. They’re good at storing images and a lot of data we don’t access very often.” The in memory architecture means that database writes are 20 times faster. X3 is an energy saver says Ellison – 10-30 %. Compression is another important aspect of X3. Compression of data on disk at a ratio of 1:10 means that substantial savings on storage costs can be made. You can watch the 2.41 min highlights of his keynote below. The full length version will be available on http://medianetwork.oracle.com/media/ shortly.